Desert Eagle Towing provides light equipment hauling services and cargo handling throughout the East Valley including: Apache Junction, Chandler, Chandler Heights, Gilbert, Mesa, Queen Creek, Sun Lakes, Sun Tan Valley and Tempe AZ. We can provide immediate and scheduled equipment, tractors, cargo and materials when you need it. We can move any type of light tractor or machine and we offer transport services for a variety of cargo and material including lumber, trees, swing sets, containers and play houses. Contact our 24hr dispatch center now at 480-440-2165 to get our team working for you. 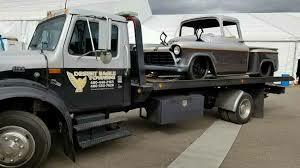 Desert Eagle Towing provides safe and affordable towing and transport for custom cars, classic cars and project cars. We understand the importance of delivering your vehicle safely to its intended location. The DET towing team is experienced in providing expert transport for all types of classic and rebuilt cars no matter where in the rebuild process the car might be. Trust Desert Eagle Towing for your project car towing needs today and call 480-440-2165. Desert Eagle Towing provides light tractor hauling services throughout the East Valley. Our team is experienced in loading, securing and hauling all types of tractors, trailer and attachments from multi-unit small tractor hauls single tractor hauling. Our fast and affordable services provide a virtual transportation department for many clients saving them time and money. We can provide emergency or scheduled equipment hauling anytime, day or night. Contact our 24hr dispatch center now at 480-440-2165 to get the Desert Eagle Towing team working for you. Desert Eagle Towing provides mobile office and shipping container hauling services throughout the greater East Valley area. Our team is experienced in safely loading and hauling all types of sea containers and mobile offices. We can haul and even provide long term and short term storage for all sizes of shipping and freight containers. We provide construction trailer, Conex box and mobile office hauling services when you need them. Call our dispatch center now at 480-440-2165.